Former unified middleweight champion Gennady Golovkin's return to the ring and subsequent debut on his new home of DAZN is set. Yahoo Sports' Kevin Iole revealed that GGG will return to competition to take on undefeated Canadian middleweight and relative unknown Steve Rolls on June 8 at Madison Square Garden in New York. News of the fight being close to finalized on Tuesday was first reported by Chris Mannix of Sports Illustrated. Golovkin (38-1, 34 KOs) will be coming off a nine-month layoff by the time the bell rings in June, and he'll be coming off the first loss of his illustrious professional career. 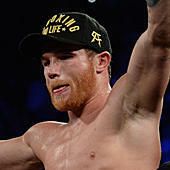 In September 2018, GGG was on the wrong end of a majority decision in his much-anticipated rematch with Canelo Alvarez, losing his middleweight titles to the Mexican superstar. With the two fighters now together under the same DAZN banner, the hope is that a trilogy fight will be in the cards sooner rather than later. Before that, however, it was expected that Golovkin would take on a tune-up fight coming off the layoff with his new promoters, and the up-and-coming Rolls (19-0, 10 KOs) apparently fits that bill perfectly. While the bout will be contested at middleweight, GGG and Rolls will work the fight at 164 pounds. According to Iole, dual-press conferences are expected to take place next Monday and Tuesday in New York and Los Angeles, respectively, to formally announce the fight set for later this spring.